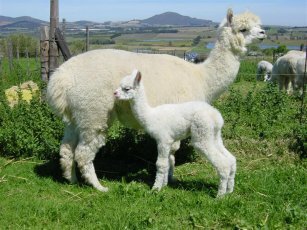 In most cases, alpaca cria (as babies are known), thrive and grow up to be healthy alpacas that get integrated into the breeding herd. 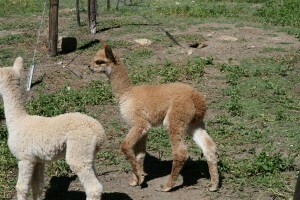 Occasionally it happens that, after birth, an alpaca female is not able to nurture her offspring – this is where us humans come in. We bottle-rear the cria and the animal bonds with the humans more than with his own kind. This poses another scenario – more than often these animals are not really suitable for breeding; especially males who would not make good herd sires, as they are too intimately connected to humans. 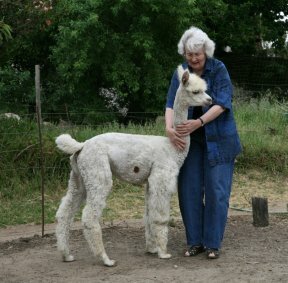 After 6 months, when such an alpaca cria is weaned, it is time to either keep it as ‘fibre boy’ – or sell it to a loving home, be it on a horse farm, a private ‘touch zoo’ or just to be part of the farm-family. Remember, they never come alone – they always need one or two of their own kind to keep them company. Males will be neutered, as they might become too bossy, when they get older.